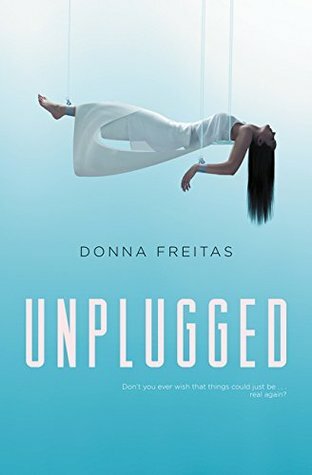 I first heard about Unplugged from the amazing Stephanie @ Teacher of YA. Last year when she posted a review raving about it, I was intrigued and decided to add it to my TBR. After a long wait, I was finally able to get my hands on it, and I was pumped! This book was absolutely worth that wait. Although I wasn’t completely sucked in at all times, I still really enjoyed the high action and the riveting plot. I know that I will for sure be recommending this severely underrated book to lovers of dystopian fiction in the future! To synopsize this story, it revolves around a teen girl named Skye. There are two worlds existing during her time- the Real World and the App World. When she was younger, she was sent to live in the App World apart from her family because they believed she deserved the best. Fasting forward a few years, Skye is unhappy in her world and would do anything to go back to her beloved family. Because the borders have closed, it is very hard for Skye to return to her old world, but she makes it by the skin of her teeth. Will she like what she sees, and most importantly, will she reunite with her family? I really appreciated how Freitas crafted Skye. Her bravery, loyalty, and determination made her an amazing role model for readers. She risked a ton just to see her family again, and to me, that is wisdom and faithfulness at their best. I can’t wait to see how much more she develops in the next instalments of the series! In addition to the strong main character, fantastic world-building and an engaging plot also contributed to making this novel a very enjoyable one. I absolutely adored how there were apps for everything in the appropriately named App World- they replaced stores, food, clothing, and literally anything you can name! Also, the story started off slowly and didn’t pick up the pace until about halfway through, but once it did, I LOVED it. I don’t normally devour books involving a lot of action, but this one had me sold. All in all, having completed this book is making me very hungry for the next one. It is so riveting that the characters, plot, and world-building aspect will leave you immediately wanting more. Thus, I will again not hesitate to recommend Unplugged to avid readers of dystopian and sci-fi novels- unplug from your technology, go to the closest library or bookstore, and pick up this book! You will certainly not regret it.